Dogs and puppies won't open wide and swallow! You can use peanut butter on a spoon to hide a pill, though--and tasty liquids may be lapped up,. All owners need to learn how to medicate a puppy. Almost all treatments, from topically applied ointments and salves for such things as hot spots to oral medications like pills for heartworms or liquids, and even injections can be given at home once you learn how. Many times, giving medication at home can be easier on your puppy and you than an extra car ride to the veterinarian's office. Whether your pup is big, small, or in between, enlist an extra pair of hands for medicating. That way, one person can restrain and comfort the pup, while the other performs the treatment. Wrap a small pup in a blanket or towel may restrict wiggles enough for you to treat without a second person's help. For those confident owners who have established a trusting relationship with their puppies, restraints may not be necessary. Puppies usually accept skin medications without restraints, unless the area is very sore such as a hot spot. When the area being treated is within licking range, though, care must be taken that the dog does not clean off the medication. 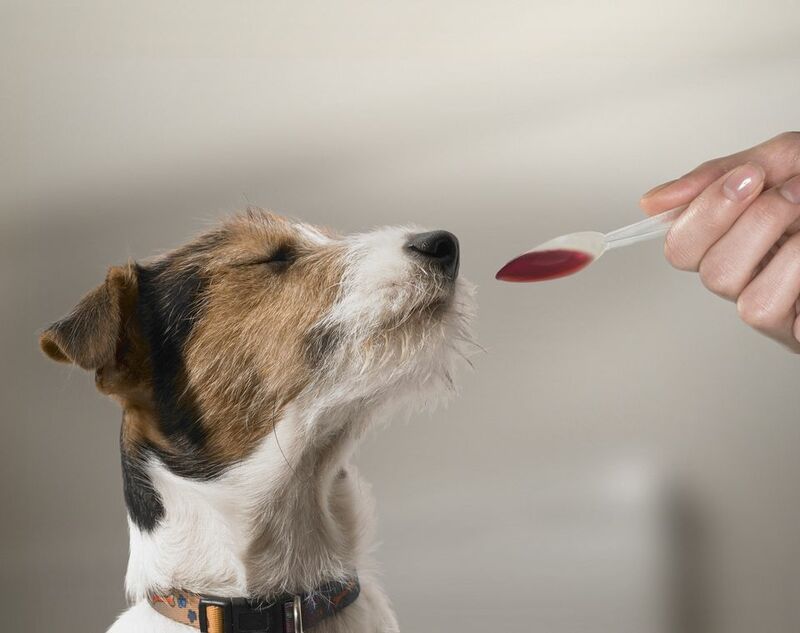 Some medicines may taste bad and keep your dog from licking, but don't count on that deterring a determined canine. After applying the lotion or cream, engage your pup in a favorite game or keep him quiet for 15 minutes or so until the medication is dry or absorbed. Other times, it may be necessary to apply a collar restraint like an Elizabethan collar to keep your fur kid from bothering the wound. Medicine for ears also usually requires minimal restraint, unless the ears are very tender. Ear mites, for example, can leave puppy ears quite sore, and ticks that target ears may create raw spots. To treat ears, have the puppy lie down on his side so the opening of the affected ear is directed at the ceiling. Then grasp the external ear flap—the pinna—with one hand, and drip in the medication. Hang on firmly to the ear flap because the tickle of liquid medication can prompt him to shake his head and fling the medicine out. Avoid sticking anything inside the sore ears. Gravity allows the treatment to flow into the ear. You may gently massage the outside of the ear base to help evenly spread the medication. Ask your dog to turn over, and repeat the procedure on the other ear. When medicating eyes take care you do not touch the dog's eye with the applicator. A second pair of hands may be necessary to steady your puppy's head so that his movement doesn't inadvertently injure him. Liquids can be easily dripped into the affected eye by first placing one hand beneath the dog's chin and tipping his face toward the ceiling. Squeeze the ointments into the cupped tissue of the lower eyelid, or into the corner of the dog's eye. Once applied, gently close the eyelid to spread the medicine over the surface of the eye. Swallowed medications come in liquid, paste, or pill forms. They may be given in squeeze bottles, eye droppers or syringes that make puppy medication simple. Sometimes they are flavored as well, so the puppy takes them like a treat. To give liquid medicine, tip back your pup's head. Insert the applicator in the corner of his mouth. Squirt the medication into his cheek. Then hold his mouth closed and keep his head tipped up while you stroke his throat until he swallows. After you treat your puppy and he’s been a good boy and taken his medicine like a grown up dog, don’t forget to praise him. When you associate the treatment with something he likes—such as a special treat, praise or a favorite game—your puppy better tolerates medication. And puppies who don’t fight and get upset over treatment get well faster.